I absolutely love this once a year bonus, it feels like a real gift. I like to get up and make an early start to the day. I don’t always use it as an opportunity to give to others though. Elizabeth Shaw are asking people to use this time to be thoughtful. Little things can make a big difference to someone’s day and brighten it up no end. Contacting an old friend or near forgotten family member is likely to be much appreciated. Buying something at a local independent shop is an act of thoughtfulness in our time strapped lives where convenience is king. Visiting a housebound neighbour is a fine thing to do and saying thank you with chocolate is a great way to spread a little happiness. Once upon a time, I used to practice mindfulness. I only did it for an hour a week, but it did help me focus. When I’m more focused I’m also more thoughtful as my brain isn’t firing off in all directions at once and sending itself into a state of paralyses or procrastination. It gives me the space to think and to plan. So, maybe I should spend my extra hour this Sunday meditating. Regular readers will not be surprised to learn that my gestures of goodwill tend to centre around baking. I often bake cakes for birthdays, send biscuits through the post for Christmas and generally get busy in the kitchen to say thank you for all the kindnesses done to me. I’ve been known to bake a cake to welcome new neighbours, fill my mother’s freezer so she has something to offer guests who call by and an occasional random bake of kindness. Spurred on by Vanessa Kimbell and her Random Bakes of Kindness, I once took a batch of biscuits down to the railway station as a thank you to the hardworking staff who get short shrift from many of the passengers. They were a bit nonplussed at first, but were thoroughly delighted by the gesture. I’ve also wended my way around town with a basket of cakes, visiting the amenities I use regularly. Seeing the smiles and delight on the workers’ faces definitely made it all worth while. You can read about about it and see the happy faces in this National Chocolate Week post. Do you have any stories of thoughtful gestures that you or others have made? Let me know by commenting below and why not enter this splendiferous chocolate giveaway whilst you’re at it? The good people at Elizabeth Shaw are demonstrating their thoughtfulness by offering one lucky reader a hamper of their chocolates worth £50. I haven’t tried everything by any means, but I can highly recommend the Amaretto Flutes and mint crisps are always a winner. These chocolate boxes are widely available at most supermarkets and many independent stores. 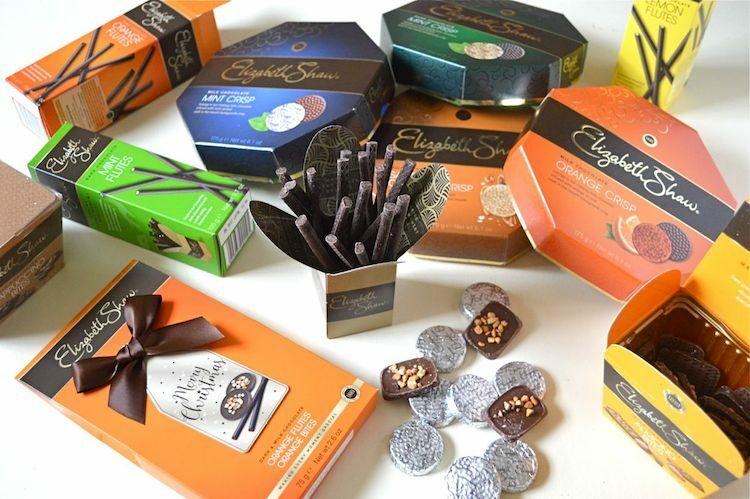 Elizabeth Shaw is kindly offering one Tin and Thyme reader a chocolate hamper worth £50. To be in with a chance of winning, please fill in the Gleam widget below. You will need to leave a comment on this post, answering the question, which then gives you additional chances to enter if you so wish. Gleam will pick a winner at random from the entries received who will then be contacted via e-mail. If you are commenting anonymously, please give me some way of identifying you as I will be verifying the validity of entries. Any automated entries will be disqualified. This giveaway is only open to those with a UK postal address. Winners will need to respond within 5 days of being contacted. Failure to do this may result in another winner being picked. There are no cash alternatives. The chocolates are offered and provided by Elizabeth Shaw and Tin and Thyme accepts no responsibility for the acts or defaults of said third party. Tin and Thyme reserves the right to cancel or amend the giveaway and these terms and conditions without notice. Thanks to Elizabeth Shaw for sending some of their chocolates. I was not required to write a positive review and all opinions are, as always, my own. You can find other competitions at The Prize Finder and Loquax. I’d phone my best friend, and have an uninterrupted hour of chatter. I am helping my friend revise for her work exam by doing quiz questions for her. My dear friends from the Ukraine have often invited me home for lovely meals but I have yet to do the same for them. Maybe lunch ?! An elderly neighbour has recently been widowed and I like to call in for a coffee and a chat, I often take a home baked treat ! I could use the extra hour to help my elderly neighbour tidy her garden; it’s getting too much for her to cope with on her own. My daughter goes on holiday this weekend and I intend to iron all her uniform for work for when she gets back 🙂 I know she will be very grateful! Cook a roast dinner for my daughter and her boyfriend to say thank you for my wonderful week old granddaughter! Help mum learn the internet as she has never been on a laptop before, and with the extra hour that gives me more time with her. What a gorgeous post! I love that you wander down the street with a basket of bakes! I’ll make a lovely Sunday lunch for the family! our little Grandson is staying with us this weekend, so I will be up early making his breakfast, so his Mum and Dad can have a lie in. I would brighten my Mother’s day by setting off earlier to collect her to bring her back to ours for the day, which is what I will be doing. I’d brighten up my own day by spending an extra hour with my Godchildren, they are 2 wonderful little boys that have their own fabulously individual personalities and certainly keep me on my toes! i would treat hubby to breakfast in bed! something hes never had! by staying in bed myself I will be less grumpy which means i’ll be more delightful to be around… just spreading the love! I would brighten my wife’s day by getting up an hour early and helping out with the housework! But then again…..
I’d use the extra hour to visit our family friend in his nursing home – he doesn’t have many visitors and gets quite lonely. Which reminds me, I need to organise our next trip! I’d like to help someone with their uni work and then maybe one day they’ll return the favour! I’m going to be on an airplane I’m afraid, but I’ve been off visiting my Mum and Dad and tried to take a load off of my Mum’s plate. Seeing them brightens up MY day though! I would take the time to show someone directions if they ask for help. Spending time with my Mum, who has been housebound recently. She misses getting out to shops, bingo meeting friends etc. So she enjoys when we visit, likes to know what we have been up to as well as future plans. So we will tell her of any bargains in the shops, play we attended locally, people we have met etc. We will chat about tv shows we watch, as she likes comedy etc. We will chat to the budgie, she enjoys him whistling and chatting which he will do when we talk to him, or when he hears music he likes from the tv etc. It is our way of keeping Mum connected with us and the outside world whilst her health condition doesn’t allow for getting her outdoors. I’d like to brighten someone’s day by hanging out and chatting or cuddling, or in any way sharing some quality time. I will pay a visit to my elderly friend. She likes a good gossip over a cup of tea and a handful of her favourite biscuits. Christmas isn’t Christmas without Elizabeth Shaw mints!! We’ll again this year be collecting warm clothing and toiletries for the homeless. It’s important to remember, especially as we approach Christmas, that not everyone is as lucky as we are. I will treat my children to an extra hour of my full attention playing games etc. cups of tea all round for all my family. I’m heading down to the homeless shelter this afternoon to take them a big bunch of my old clothes! What a very good idea Emily. I always give mine to Oxfam, didn’t think about that as an option. I’m letting my husband have an extra hour in bed – he deserves it! I’d brighten my hubby’s day by getting up with our daughter when she’s up at crack of dawn! I’m spending the extra hour having some quality time with my 4 year old- I miss her since she’s gone to school! I will make my housemates a lovely breakfast and a cup of tea! Let my hard working husband have an extra hour in bed, and make him his fav brekkky of steak and eggs! I’d give hubby an extra hour’s sleep. Treating my partner to a wonderful fried breakfast, sausages, eggs, tomatoes mushrooms with hash browns and toast. This should brighten up his day before taking him to watch football this afternoon. I would try to be a better person and when the toddler wakes up at an indecently early hour I’d get up with him so my other half can sleep him. It wouldn’t be easy! Take the bins in for my elderly neighbours after they’d been emptied. With my extra hour this morning I got up early to feed my sister’s cat while she’s away and then I surprised my Grandma by joining her to breakfast which she loved! I’d run my husband a bath & cook him his favourite tea as I never look after him or spoil him! I would take my dog a long walk in the countryside, and give my hard-working husband a well deserved lie in. By spending quality time with my family probably helping my daughter with her Lego. I regularly walk a friend’s dog at the same time as mine to give her a little extra time – she is an extremely busy working mum. Instead of having an extra hour in bed, I got up and drove my daughter to work, enabling her to spend longer in bed. I would help mum out by looking after her kids because she rarely gets a moment to herself. by making my partner breakfast in bed! I’d like to spend the extra hour helping my Mum out in her garden. I got up early and made blueberry pancakes for breakfast for my daughter who has a 7 hour drive in front of her today. We both enjoyed the better than usual breakfast! Sending reiki to anyone and everyone who needs it. Meant to say by sending reiki to anyone and everyone who needs it – a form of energy healing in case anyone doesn’t know what it means. I was out early doors litter picking the street. Someone had dumped bags of rubbish beside, not in, the street bins which the seagulls had ripped into so it was looking awful. Hopefully it put a smile on someone’s face when they looked out and the mess was gone! I spent the extra hour (and more) going for a walk with my family who aren’t together that often anymore! I’d love to bake something tasty before work to brighten things up for my coworkers! oh my god!! This would be fantastic for Christmas and might be quiet for a hour or two! i’ll be carving pumpkins with my 3 year old daughter and making skeleton jelly! I used it to spend some time with the kids. Something quite rare due to busy lives. I rang my dad’s second wife (now a widow) and had a long chat with her. I would have a nice cup of tea with them and maybe watch a movie or two with them although i’d let them pick what movie we watch. I would pop round to my mums with cakes, pop the kettle on and then have a good old chat with a cup of tea. With the extra hour I’ll bring a smile to the family’s face by making a crumble & real custard. We managed a lie in and then we took the kids out for the day, we played crazy golf and then we went shopping and they got tons of new clothes. We don’t often have as much time to spend with them so it was lovely. I would use my extra hour to brighten my partners day, by taking care of him and making him tea as he has been so good taking care of me! I’d like to brighten my friends day. She is on her own with a baby, and I’d like to give her an extra hour or two in bed. Making gingerbread for my sports team before their race! I would use the extra hour to do more of what I do every day and that is use good manners to do little things that brighten other people’s day, stuff like letting them go in front of me in a queue. I would invite my 92 year old gran to lunch as she’s so independent it would be lovely to treat her by cooking for her. I would sleep for an extra hour as I never seem to get enough. I will be going to make a pot of soup and bring in into work for everyone! I’d surprise my children with a fun game, some quality time together and lots of cuddles! I would bake some biscuits for friends and invite them over for a cup of tea. I would do my elderly neighbour’s shopping. Now that would make my entire month. I hate cleaning the car. I’d bring my husband a cup of tea and a bacon butty in bed – he usually gets up with our toddler so I know he’d appreciate it! I spent the time with the kids, they were up early anyway so before other half woke up I made it all about them mommy and daughter time. I finished knitting a snood for my sister during my extra hour – she loves it! I’d like to take my gran shopping to get all the things in that she needs! An extra hour to play a game with my kids…there are never enough hours in the day! I left my wife in bed for an extra hour because she works hard enough as it is! I would use the extra hour to brighten my better half’s day, and as food is a great way to keep him happy I would make him a special dinner and dessert. He is brilliant at eating whatever I cook but as I am lactose-intolerant he rarely gets homemade meals with milk, cheese, butter etc so I would spoil him with something like creamy shepherd’s pie or roast dinner using milk for the Yorkshire pudding and a nice chocolate creamy dessert. I’ll also get around to putting my bird box/living garden up to sheer the garden wildlife up 🙂 Fingers crossed. Your husband sounds lovely. Mine’s a bit like that too. He’s not vegetarian, but he’s happy to only eat veggie in the house. I like the sound of your living garden box. I like to hand out my homemade goodies to the homeless. I don’t know, my partner is the community minded one and will help anyone who needs it. I don’t do very much now, pesky MS. Oh well. There is always chocolate, kindle, and scrabble on isc.ro. Now that is just lovely and I expect, not something they’d get very often. I think I’d copy your example and make more use of my local shops. It’s too easy nowadays just to pick up everything from the supermarket so shopping locally would mean so much for those trying to make a living by providing these shops. I think it’s something like £7 in every £10 stays in the local economy when using independent shops and only £3 in every £10 if you use a supermarket, but don’t quote me on that! I’d let my hubby have a long lie as he works very hard for us all. I would like to brighten my neighbours day by delivering some cupcakes. I was thinking yesterday how bad it is I don’t even really know the people I live next door to and it would be good to reach out and say hi, with a cupcake! A lovely way to say hello Lucy. It’s so hard in our very busy lives to take time to do things, like get to know the neighbours. I think one of the most thoughtful things to do would be to bake my tangy lemon cake for the girls who work in the local bakery. They are so used to me buying my bread there I’m sure it would make them smile if I return the favour with cake. What a lovely thought Julie. I bet they’d really appreciate that. Great idea using our extra hour to do a nice thing for someone else. My sister has broken her ankle so just taking her for a ride in the car as she is going crazy stuck at home. I’d have an extra hour in the garden ……mixing concrete for the hubbies BBQ project..it’ll brighten his day and save his poor back! I’d treat them to indulgent afternoon tea in a swanky London hotel. I’ve been doing gardening for my brother-in-law, who is a farmer so he doesn’t get much time to do the weeding. I have complied a CV for my partner and helped him apply for a few jobs. He suffers from Dyslexia and finds it difficult to do this himself. I would take my mum out for a treat. I didn’t actually do anything with it as I was asleep but I didn’t snore so didn’t give the OH a headache for once. I used mine to make mine and my boyfriends’ lunches for the next week 🙂 He hates getting up early to make them! Make them breakfast in bed with the paper. I’d treat my Mum by taking her out for an Afternoon Tea. I would brighten up someone’s day by giving them this and a great big kiss! Let my partner have an extra hour in bed, as she has to spend a lot of every night up with our little girl who has epilepsy, and I work nights. I’d take my mother in law out for afternoon tea – I think sometimes the nicest gift you can give someone is your time and she deserves it. I would brighten my daughters day by taking her for a spa day . Id make my elderly neighbour a nice fruit cake. We have been spending a long weekend every month with our daughter, son in law and little granddaughter. We have our granddaughter’s toddler bed in the room we are sleeping in, which means we get up when she wakes. This allows our daughter and her husband a nice lie in on Saturday and Sunday. This time when we visit they are also going out for a date night, to see a show and have a meal without a toddler in tow. We grandparents are happy as we get to spend more time with our granddaughter, and our daughter & son in law are happy as they get some time for themselves. That sounds like a totally win win situation Fiona – lovely. I’d cheer up my friend by arriving with this amazing hammer full of chocolate! Well, I’m a nurse and was working the night shift when the clocks went back, so I spent my extra hour caring for all my patients! I would help my nephew and niece with their homework and listen to their reading. Take care of my nieces so my sister can get some extra sleep! I like to help out with my brother at a new local charity. I would love to have some ‘us’ time for hubby and I, a little lunch in a lovely bistro would go down a treat! Offered practical help to elderly neighbour whose husband died recently. I have shown her how to deal with unwanted emails and will sit in the car when we go shopping to give her confidence. I’d make fairy cakes for the kids coming in from a hard day at school. They love a wee pre dinner snack and rush home to see what awaits them. Taking some of wife’s home cake around to my elderly neighbour. we have started ” child minding ” daisy,its a joy for us. I spent the extra hour (and several more) tidying the garden for an ill friend. Going for a coffee and cake with my mum. Long overdue! I’d like to get up and cook a really nice breakfast, hopefully with the extra hour I’d be more prepared and not burn it! I spent it cuddling up with my family in bed: my partner, 2 girls and a kitten. It’s so important for us to spend time together just chilling. I like to send surprise packages in the post. I’d love to be able to spend extra time with both my nans. I’d bake some bread and deliver it to the local homeless shelter. I would make my son a gluten free cake for a treat. I would take the time and spend the extra hour with my children, just to make sure I am caught up on everything going on in their lives, and just hug them 🙂 These days we are all so busy its easy for something to slip I would ensure this didn’t happen. I spend an extra hour playing games with the kids in the morning or, if they’re late getting up, I would have a bit of ‘me’ time on the laptop – I don’t get to use the laptop once the kids are up! I like making people food, it’s not selfless though because it does make me feel good when someone enjoys something I’ve made. I used the extra hout to go through some old books and sorted out a load to donate – just need to get them to the charity shop now! I need to do the very same thing. I always find it such a painful process though. I made a Sunday roast for 6 of our friends. I would cook dinner for my husband, as i never usually have time at the end of the day! allison. I took the kids and the dogs for an extra long walk with my extra hour. I would give the spare room a good sort out so that we can finally use it for some proper family fun! I would let my husband stay in bed whilst I cook him a full english, he would love that! I’ll sweep up all the leaves that have fallen in my Dads garden, and generally have a tidy up. It’s a bit cold outside for him, and the garden’s looking a bit autumnal and messy, so good to get it back in tip top condition again! I would make my husband a nice steak which is his favourite and it would be double the surprise as he does all the cooking too! I’d like to leave the house earlier so I have time to stop and chat to the people that say hello. I’d like to make them smile by having a sing-song! I like to take out my neighbour’s dog for a walk across to the local copse. Thanks for running this great giveaway I would certainly be sharing this with my family, which they would love. I’d spend the extra hour Christmas shopping for my mum – she deserves treats for everything she does for us kids…even though we are fully grown adults! That sounds like a lovely thing to do Jane. I would make a batch of my signature dish, Shepherds pie and take round to my next door neighbours. I would heat up and even stay and have a good chat reassuring them that if they need any help that they only have to ask. Let my children sleep one hour extra in the morning and not nagging them to get up! I would love to do an extra hour of baking and then drop them around to my friends houses! I’d take my Mum out for lunch as a treat. I would bake a lot of biscuits and cakes to share, snacks make anyone happy! Make a lovely lunch for my friend who recently had a baby and is finding there aren’t enough hours in the day! I would spend the hour listening to them talk – as nobody gets a chance to talk without interuption. Light a few candles and crack open a bottle of Rosé. See whats on their mind!! I’d get something nice baking for the kids, they love cake and everything sweet. I bet you’re popular Jo. There’s nothing quite like freshly harvested produce from a friend or that you’ve grown yourself. What a lovely giveaway on the run up to xmas, thank you. I’d make my own day brighter with a gin, hot bath and a book! This would be dinner party gifts sorted for the foreseeable! I would brighten someone’s day by smiling at them. I have an elderly neighbour , who had a stroke last year . The last few months I’ve done her shopping for her and one day we got taking about films . I’m a B&W movie fan . Now once a week we have a film evening . Think it brighten’s both of us up – and her plums in rum , that she bottled God knows how long ago are a lot better than popcorn . I would surprise my parents by taking them out for a nice lunch. I would do some of my Mum’s housework so she could put her feet up. I’d clean the oven for my Mum. Magic filled coffee cups for all my fellow students! I would like to make my partner breakfast in bed! I’d walk some dogs at the local sanctuary. Keep me fit too! I would cook dinner for my Mum, to give her a break. Making yummy dinner for my family. I’d like to brighten someone’s day by chatting to a neighbour who needs someone to talk to, and also other shoppers in the supermarket who want to talk. Social contact is difficult for some people these days. I spent my extra hour painting the bases of water bottles so the brownies could make a poppy wreath for remembrance day. start off with breakfast in bed and then a nice early morning walk in the country. I’d like to visit my Granny and take her and her dog for a walk. I’d take my Nan in law’s gorgeous pup for an extra long walk. She loves long walks. I would take my mum out for afternoon tea. She deserves a treat. I’d do some of the baking and crafting for people that I never find the time to get around to. Spend quality time with my mum. I used the extra hour to let my partner have a lie in while I was up watching Baby TV at 4am! I would bake a cake for my friend who can’t get about too well and enjoy it with a cup of coffee and a chat. Would spend the extra hour on the phone to my mum who lives in Australia. I brighten someone’s day with my extra hour by ringing relatives and having a good old natter. I would weed as many of my elderly neighbours’ gardens as I could. I don’t know what it is but there’s something really special about Elizabeth Shaw’s chocolate nom nom nom! I make a point of smiling and saying a cheery good morning or good afternoon when I pass people who live near me in the street. I will be making mince pies for my son to take away with him. I would make some cupcakes for me old 94 year old mum- she used to make them for me !! I would like to be able to spend the hour with my mother, even just having a chat. An extra hour would be spent knocking up an extra special family breakfast for my family.Never have much time for a cooked breakfast so this would be a real treat. I always think a smile is the best way to brighten up someones day as it is infectious! I would offer to babysit my niece and nephew and give my sister the afternoon off! Honestly, I like to have a clear out as I am always collecting bits and I take it down a charity shop, a different one each time. I also every Christmas make sure I go through every single cupboard in the kitchen and take out all the food we don’t use along with any blankets/clothes and take them to a local homeless shelter that don’t get a lot of funding! Great idea Louis. It’s time I had a good clear out. Ah now that’s lovely. Will you actually do it do you think? I’d give flowers to people and lots of presents to love ones at Christmas and other celebrations. I’d have a much-needed catch-up with my flatmates. We live in the same house but rarely see each other due to work. I would use the extra hour to take my mum out, perhaps for a lovely afternoon tea. I’d love to spend the extra hour visiting my mum, making sure she’s ok and has everything she needs, taking her some flowers, and having a lovely catch up. I regularly brighten peoples days with cake. I make and sell cakes but every now and then I take an hour out and bake a cake to share amongst friend and neighbours. The last time was yesterday. I baked a rich choc cake with choc ganache filling and shared it with friends…lots of smile faces #cakeeules! Oh no Katrina – both of them? That’s terrible. An extra hour with my Nannie would be lovely as we don’t get to see eachother often! Ooh, I love a good bit of chocolate at Christmas time, well, all the time actually. I’d make some cookies for everyone. I’d call my mum and also my nan for a chat about the latest gossip to cheer them up and would bake my friend a cake. Yes, life is so very busy Ellie and that makes it particularly tought for folk who can’t get out and about much.